The former popular landscape was an expanse of warped shapes, out of which some were as tall as a Manhattan skyscraper, and it was discovered by an ice-penetration radar loaded aboard NASA survey flights. According to the scientists who made the discovery, this could deepen the level of understanding concerning the way in which the ice sheets of Greenland and Antarctica respond to climate change. 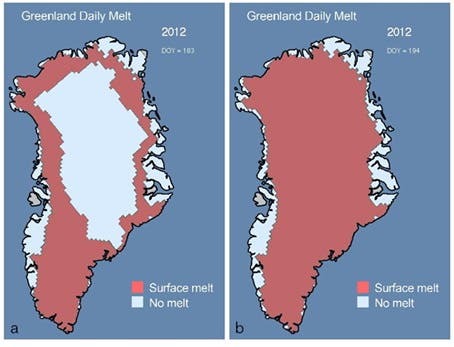 Until recently, the scientific community believed that the the shapes they discerned beneath the ice sheet were nothing else but mountain ranges, according to the specialists studying the Greenland ice sheet for evidence of change under the circumstances of global warming. ‘Everything was just flat, parallel lines. This is how the ice is supposed to be. But here it is breaking all the rules. 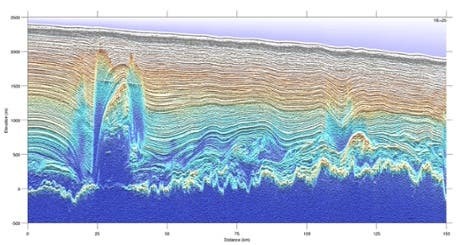 You get these crazy, folded, distorted, overtuned, undulating things at the bottom of the ice, and they are the size of skyscrapers’, declared Kirsty Tinto, geophysicist at Lamont-Doherty. It was the new technologically advanced new gravity-sensing and radar operating from NASA’s airborne surveys of the ice over the last 20 years how the scientists got to the conclusion that the formations they had identified were not rock, but ice. The melting and subsequent re-freezing of water at the bottom of the ice sheet is what caused the formations, as stated by the scientists – who were really surprised by their results. It’s even more surprising that these new-found structures, some of them measuring up to 1 meter thick, cover approximately 10 per cent of the surveyed areas of Northern Greenland. Around Petermann glacier in north-western Greenland there were found circa a dozen formations, which has caused fast changes, given that two years ago they calved an iceberg twice the size of Manhattan – but the melting and re-freezing at the bottom of the ice has been happening for thousands of thousands of years, according to the scientists. While the scientists were informed of such a process, what they didn’t know until now was that the melt-water was re-freezing into more complex formations. The melt-water is a result of the glacier warming under its own weight, and it freezes and grows up into the forms from around its base. ‘We see more of these features where the ice sheet starts to go fast. We think the refreezing process uplifts, distorts and warms the ice above, making it softer and easier to flow,’ declared Robin Bell, lead author of the study and geophysicist at Columbia University’s Lamont Doherty Earth Observatory. The process appears to accelerate the flow of glaciers, according to Bell, but Tinto said that further research was needed in order to prove this hypothesis. ‘If we want to understand how ice is going to respond to climate change, we have to understand its fundamental dynamic. It is not just that you are melting the surface and the surface is just running into the sea. There is a complicated and quite beautiful system running through the ice and you have to understand it top to bottom to understand what it is doing”, said Tinto.